I’m not ready. Mostly I’m not ready to give up my quiet morning time and share it with the children THAT I WILL HAVE TO BLAST OUT OF BED. 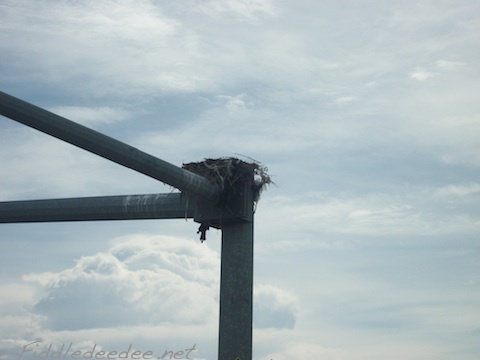 This mode of nesting that I’m experiencing is not unlike a mother of 3 young falcons which have taken up residence at a local intersection not far from our house. I’ve watched with interest over the last months at how she’s carefully woven bits of bark and twig together. But then as her brood was due to hatch, she went with the WHATEVER WORKS mode of nest building, and added bits of garbage bags and debris to fill the gaps. We homeschool moms may put forth a good face and image, BUT IT’S ALL HELD TOGETHER WITH CHEWING GUM AND RUBBER BANDS, MY FRIENDS. And some Elmer’s glue for good measure (which by the way is only NINETEEN CENTS at Wal Mart). That may be the most clever title I’ve ever come up with. Because we live in the same house that we built 14 years ago b.c. (before children), and having no idea how much room 3 industrial sized children would take up, we have had to get creative with space and storage. I’d like to think that I prefer to homeschool in our dining area because that is the hub of the house, but in reality, there is NO WHERE ELSE TO GO. So I’ve had a wall dedicated to homeschool supplies, and a kitchen table wherein I can rest my forehead when the going gets tough. Over the last number of years the area has been a mis-matched hodgepodge of hand-me-down furniture. And has not been terribly functional. 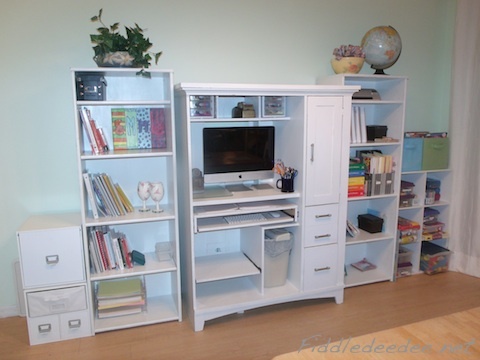 I’ve been diligently searching on Craigs List for a used white Expedit Cube Shelf unit, and a white desk. I’ve found nothing over the last year. Then I had a brilliant idea. Why not just paint what I’ve got? After all, I used to make my meager living in Los Angeles as a furniture painter. I marched out to the garage, which used to be my studio b.c. (before children). It has since become a storage dump for everything that doesn’t fit in the house. I cleared out a corner which houses my old workshop cabinets, and dusted off my favorite paint brushes. After a trip to the paint store I was ready to roll. As it were. This is what my set-up looked like before I began. As you can tell, the photographic evidence was an after thought once I began tearing everything apart. The pieces that I wanted to paint were the monolith computer cabinet and the brown shelving unit. The shelves actually belonged to Fiddledaddy’s office, and he no longer wanted them and even donated an identical set to my cause. The whole process took me about 4 days. Which shocks even me because of my physical limitations from Lyme Disease and that bonus ailment, Plantar’s Fasciitis. I found painting to be incredibly therapeutic, both physically and mentally. I’ve started a laundry list of other long forgotten projects around this house. And if I learn how to really use the camera, I may post some tutorials. The children are understandably nervous, as they’ve heard stories of how I once painted anything that stayed in one place too long. Clearly I’m all out of clever pithy titles. 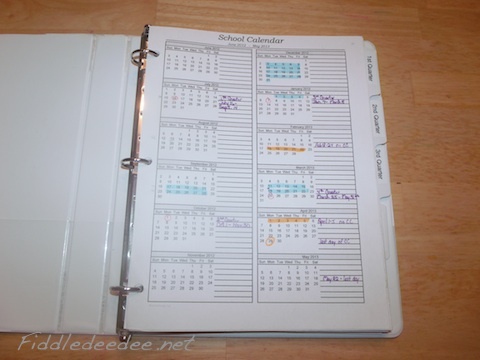 I might as well just call it: “Here’s the post I’ve been intending to write.” This post is dedicated to my SIL, Trish, who has been wanting to have a field trip over to my kitchen table to see how I put my homeschool journal together. But alas we have been quarantined with a sick child. And Fiddledaddy has been working out of town all week. Which means that I’ve been trapped INDOORS with 3 children for the better part of the week. There’s something to be said about being home with sick kids. Generally they are quiet. And you get a lot of work done. Just an observation. Not a wish. I like to make sweet tea when life hands me lemons. However this week only one of them was sick. That means that I have to keep the two healthy children from maiming one another. And at the same time keep them somewhat quiet so that the unhealthy child can rest. And WHAT LUCK sometimes the unhealthy child garners just enough strength to pick a fight with the two healthy siblings that she is trapped with. No one can blame me if I should admit to taking a swig or 3 of the Nyquil myself. Okay. The homeschool journal. I’ve looked high and low over these many homeschooling years for a journal that has everything I need. I’ve not found anything that suits my OCD tendencies. In my price range. So I decided to create my own using my homeschooling hero and mentor, Donna Young’s printables. AND THEY ARE FREE. Homeschooling in the state of Florida is pretty easy, as far as the rules and regulations go. We simply have to maintain a portfolio of our children’s work, and have it available should the school board request to see it (they have to give 15 days written notice). At the end of the year we either submit our children’s test scores (if we’ve had them tested through an Umbrella school, etc.) or a signed statement using an accredited evaluator stating that they’ve successfully completed their school work and are able to move on to the next grade level. We had our evaluations last week AND I PASSED. (Which is really what it feels like if you’re a homeschooling mom.) I send the evaluations into the school board using certified mail, and I keep a copy (along with the return receipt) at the beginning of each child’s portfolio for that year. Another organizing trick that I use is that I keep the initial copy of their Letter of Intent to Homeschool in a clear page protector at the beginning of their portfolio each year (and I just move it to the next years portfolio when I have it set up). This way if I’m ever audited (if that’s what it’s called) I don’t have to tear the house apart looking the Letter of Intent. I hope that makes sense. I’m sure it’s clear as mud since I’m not adequately caffeinated. 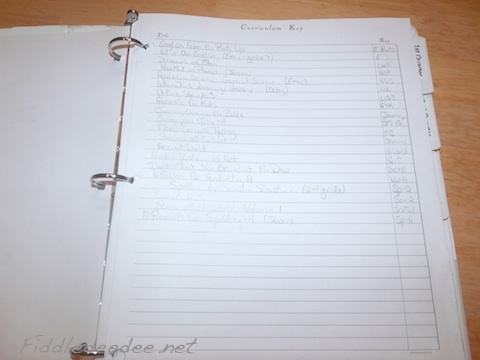 In review, I keep a white binder for each child each year, with a sampling of their work from each subject for the year. (I try to file the work each week so it doesn’t pile up.) And at the end of the year, I use my Print Explosion App and a scrapbooking template to make a nice cover using photos from that year. But I keep a journal for my own self. This helps me to keep track of what we’ve covered each week. I find a 1 1/2 inch white binder (sometimes I score these from Goodwill) but more often than not I get them from Wal Mart. I’ve been dividing the journal into 4 quarters using tabs, but this year I’m moving to a 2 semester system. Using card stock, I print out various blank forms from the Donna Young website. Honestly, if you have the time, you need to poke around there. You’ll find a myriad of useful homeschooling forms and information. My first page is my school calendar. This helps me to plan the year and is easier to see everything at one time. The next page is my Curriculum Key, so I can list all of the books I’m using, and I can assign an abbreviation when listing it on the actual journal page. We use the Book It! 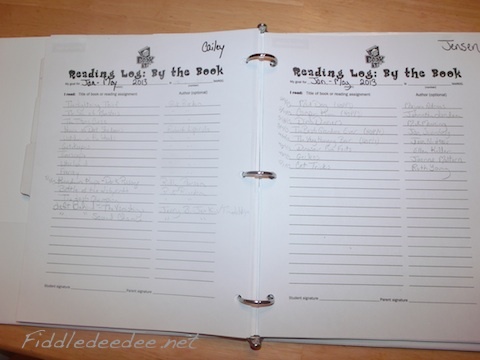 program (K-6th grade) as an incentive for reading each year, and they have their own forms to list books read. I just print out a form per child and place it at the beginning of each semester/quarter instead of having to print out a form for each month. Donna Young also has a nice form for recording books read. The actual journal pages I use are the 8-subject pdf form. I print out both sides of the card stock to fit the number of weeks for each semester. 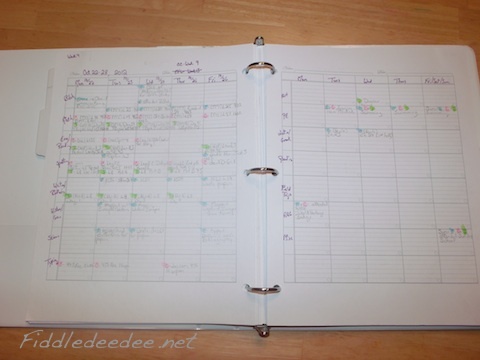 Then I can fill in the days/dates and list the subjects and extra curricular activities. It’s not a lot of space per day, but I can fit curriculum/pages along with each child’s initial. At the end of the week I hi-light each child’s initial so I can see at a glance what they’ve covered. AND IT LOOKS PRETTY. COLORS. I LIKE COLORS. I keep my journal open while homeschooling so I can jot things down as each child completes his/her work. At the end of the week I review to see if there is anything I’ve missed. It’s taken a while to get my journal just right and I’m now in the habit of recording everything daily. The great thing about these printables is that you can customize your own journal to fit your own needs. Please feel free to add your own journal experiences or ideas in the comments! The homeschool convention was everything we’d hoped it would be. And more. As you know, I make the yearly pilgrimage with my SIL, Trish, wherein we meet up with my other SIL, Cathy, for a weekend of learning, fun, and some frivolity thrown in for good measure. 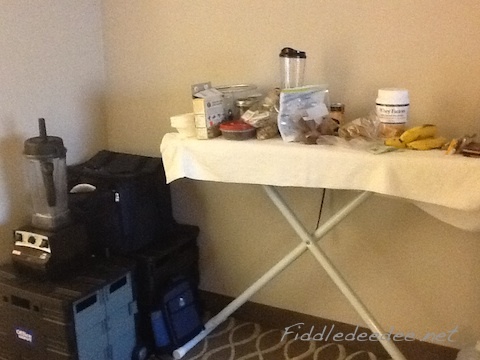 Something that I love about attending a homeschool convention, is the way we travel. There are few matchy matchy pieces of luggage among the homeschooling crowd. Nay. More often than not, attendees arrive with plastic bags and coolers on wheels. In other words, we are Motel 6 in a 4-star world. I managed to conceal my inner redneck by disguising my soft sided cooler as BOOKS, hiding it in my rolling cart (with a lid). And I packed my large plastic beach bag (which zips closed) with my snacking opportunities, rice cooker, and mini-blender. So I looked like I was ready for some fun at the pool. In reality, I never made it to the pool. 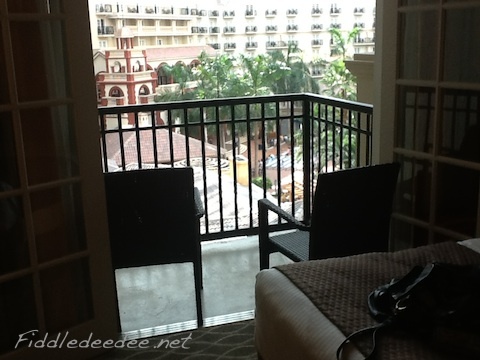 Trish and I upgraded our room to one with an atrium view. In all the years we’ve attended, we’ve never splurged like that, and we figured that what with the year we’ve had, we deserved it. It should be noted that I never stepped foot onto the balcony, considering my very rational fear of plummeting to my death should the whole thing be defective and give way. But I so enjoyed the view by scooching my chair just by the door, so that if the balcony collapsed, I could easily scurry back into the safety of the room. Yes, I could benefit from some therapy. Because of my Lyme issues, I charted my course carefully, and paced myself as I perused the Exhibit Hall and attended many seminars. My favorite speaker, was Todd Wilson (Familyman Ministries). He continues to encourage and inspire me as his words still ring in my head. If you are a homeschooler, and think you’re crazy, please find a way to listen to him either in person or on tape. He makes crazy normal. And awesome. The best takeaway that I got from all of the sessions I attended, is that the relationship with my children, and their hearts, is the most important aspect of homeschooling. On Saturday, Fiddledaddy brought my offspring up for a couple of hours so they could saunter through the Exhibit Hall. Jensen was especially interested in the creation science booths, and he was able to meet a real Creation Scientist, Catie Frates, who had given an amazing seminar on dinosaurs and the Bible. Saturday night I enjoyed a delightful dinner out at the hotel with my sisters. They are my homeschooling strength and support. And the best friends a girl could have. One of the things I enjoyed most was catching up (or at least wildly waving to) dear old friends that I don’t see nearly often enough. I did make one tactical error which threatened the joy of the homeschooling convention experience. Fiddledaddy had brought me my 2 new antibiotics for the new Lyme protocol and I chose to begin them on Saturday night. (GET ER DONE.) I spent a good deal of Saturday night and Sunday morning mentally making out my last will. The Herx effect was swift and powerful. And indeed, that’s why I’ve been scarce, the last couple of days have been spent logging many miles on my barkolounger. I’ve been fraught with a sever headache, non-stop nausea, and leg cramps. I’m happy to say that the symptoms are beginning to subside and I’m pretty sure that I’m actually going to live. Over the next few weeks I’ll be charting, planning, and preparing for the year ahead. All the while counting the days until next years convention. As our homeschooling journey has come to an end, without therapy OR bloodshed, it was time once again to hock my wares at a used curriculum sales. On Monday morning, I used my minions (students/children) to haul our boxes of no longer needed curriculum to a local sale. On of the reasons that I love selling at a used curriculum sale, is not to make money, although that’s a perk, but rather to SHOP. Once I have my table set up, I’m free to peruse other tables in search of needed items for our upcoming year. In fact I had my trusty clipboard with my I Wish I Wish curriculum items. It should be noted that my sister-in-law, who shall remain nameless, MOCKED me as my list was not color coded. I did not find any of my own needed items, but I was able to revel in the joy when one of my dearest co-horts in homeschooling found an Apologia Science Journal that she was looking for. Only a few pages were filled in, so the $1.00 price tag was a steal. And then she began reading the pages that had been used. We have no idea who Bill is. A good rule of thumb when buying used curriculum would be to always double check the previous owner’s handiwork prior to handing it over to your own children. This makes me think that I ought to go over our own workbooks with a fine tooth comb before throwing it in the “For Sale” table. And now I am going to unplug for a nice long weekend as I attend our state homeschool convention. WHERE THE NEW CURRICULUM hangs out. My joy knows no bounds. Have a wonderful weekend, my friends. I would love to tell you that our flooring issues are solved. But that would be a lie. I can tell you that our tile company sent a very nice young man out to fix the grout that had been installed incorrectly. And not ONE DIME did he have to drop into the cuss jar. In other words, I didn’t have to hold my hands over my children’s ears as I scurried them out the door. Refreshing. And he did a wonderful job fixing the problem, and a jack hammer did not have to be dispensed. We now have the front room and Fiddledaddy’s office that needs new flooring. If I come and go through the garage, I need not think about that process. We have someone coming out on Tuesday to take a look at our shower to tell us if it can be fixed or if we have black mold growing up the walls and in that case, I’m torching the place. On a brighter note, Emme made it through not only her end of the year Classical Conversations finals, but her two day Stanford Achievement Testing as well. And no one died. Classical Conversations has been such a wonderful experience for her academically (and socially) this year. However, it looks like there will not be a Challenge B at our CC location in the Fall, so I’ve had to look into other options. We’ve settled on a local co-op for 7th through 12 grade homeschool students that comes highly recommended. She will attend classes one day a week, and keep up with her workload independently at home. This is a great opportunity for her to take some classes that I don’t feel qualified to teach. And if this year goes well, she will be able to continue with the co-op through high school, taking Chemistry, Biology, upper level History, and Latin. She has met and already adores her new literature teacher. I think this will be a wonderful year of growth for her. But we are going to miss our CC community like crazy. In two and a half weeks, I’ll be able to say that we have made it through our 8th year of homeschooling. No one is more surprised than I am. As Fiddledaddy will tell you, I quit homeschooling every Friday only to resume each Monday. I’ve seen perhaps the greatest growth in my children this year. My Emme is maturing into such an amazing young woman. My Cailey READS CHAPTER BOOKS NOW without coercion. In fact, she rarely has her nose OUT of a book. I never ever thought that would happen without costly bribery. And my son, the budding scientist, is reading AND WRITING real words. Of course he signs his name “Tyrannosaurus Rex” on all of his papers. His handwriting is horrifying, but at least he spells it correctly. I choose my battles. Now all that’s left is for me to dot my I’s, cross my T’s, and PACK FOR THE HOMESCHOOL CONVENTION. After falling on my face and thanking the good Lord for getting me through another year without the use of psychotropic drugs. A while back I reluctantly divulged that I had hit a home schooling wall and had in a moment of extreme passion, submitted applications to enroll my 3 children in the charter school that is being built in our area. There is a huge amount of hype surrounding this school, and since thousands of applications were submitted for only about 600 spots, a lottery was held. I dismissed the idea of the charter school when I learned that they had decided not to include an 8th grade class in the first year of the school’s opening. Because that excluded my eldest student, and frankly, the thought of having all 3 of them under one roof…someone else’s roof…appealed to me. It wasn’t a proud moment. But I’m the first to admit that home schooling ain’t for everyone. And sometimes, just sometimes, even the moms who have been at it for EIGHT LONG YEARS get a little weary. Especially in March. Especially when you have 3 headstrong, opinionated, and very bright kids. Especially when you’re battling Lyme Disease, and struggle to put one foot in front of the other just to get through the day. So. I put the whole Charter School idea out of my head. On the day of the lottery, I received 2 texts from friends who were there at the drawing (it was well attended, as many many parents were hoping for a spot), and my two youngest children’s names were drawn. I like making tough decisions the easy way. When it’s out of my hands. I had until today to pull together their paper work and submit it. Over the last week or so, I really had come to the conclusion that I needed to keep Jensen at home because of his physical limitations. He suffers from Atopic Dermatitis and various allergies. And of course he still thinks he’s a dinosaur hunter, and is likely to pull an imaginary gun out to shoot a threatening T-Rex at any given moment, and well, lately that doesn’t go over well in the public school arena. In the end. I sent an email to the charter school secretary relinquishing our two spots. I actually didn’t want to stop home schooling them. And I really do think that it’s the best decision for our family situation. We have come up with a plan to give me a little wiggle room for our next home school year. Emme will continue with Classical Conversations one day a week (she’s thriving there), and on that same day, I will be able to enroll Cailey and Jensen into a local enrichment/tutoring program run by a woman I’ve known for years. I feel they will be in very capable and wonderful hands for that one day, and I will be able to carve out time to complete all of the paper work that is required for running our (3) businesses from home. And maybe run a mop across the floor every so often. All this to say, if you’re a home schooling mom, and you’re struggling (I know of very few who aren’t) YOU ARE NOT ALONE. Sometimes we need to just explore all possibilities, and try to find solutions in unusual places. And of course rely on our friends to talk us down from the top of the kitchen cabinet. Therefore, I am committed to staying the course for another year. Grasping firmly to my dear home schooling friends and a large bottle of extra strength Excedrin. 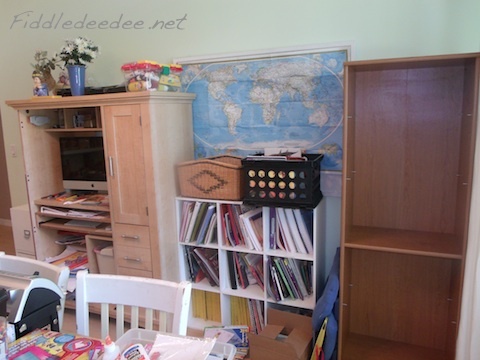 I think this is the time of year when a homeschool mother’s thoughts turn to then end of the school year, or military boarding school, or a nice rest in a padded cell. This last week we received a beautiful color 5×7 post card in the mail announcing the opening of a new state of the art Charter School that is being built in our area, for K-8. I clutched it in my hands, pouring over all of the promises that were able to fit in the 5×7 space. I circled the date for the informational meeting on the card, and transferred the time to my dry erase calendar that resides on the front of the refrigerator. AND I WROTE IT IN PERMANENT MARKER. I’ve often stated that I’m a reluctant homeschool mom, homeschooling for 8 long years. I quit every Friday, only to begin again on Monday. I’m not here to debate the merits of homeschooling, for there are many. I’m also not here to debate the merits of the school system, for there are many. Homeschooling is a very personal choice that is dependent on the particular needs for each individual family. It’s also not for everyone. Homeschooling has served our family well, but I have to come clean and tell you. I. Am. Tired. I am tired of juggling the homeschooling duties, cooking, grocery planning, shopping, all while playing banker and accountant for our 3 businesses. 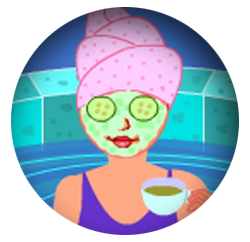 And I’m still battling Lyme Disease, which can leave me so fatigued. Mind you, I am a fully functioning Lyme patient, and I’ve MADE HUGE STRIDES, but there are still issues. For the last week or so I’ve considered not homeschooling next year. I attended our weekly homeschooling park day last Friday, and the post card about the charter school was the talk of the group. It seems I’m not the only homeschooling mother who feels she’s going down with her ship. I’m learning all I can about this whole charter school business. It’s still a public school, but there are UNIFORMS, and heavy parent involvement. It’s hard to really discern the politics behind the whole thing, because while this beautiful school is being built, other schools in our area are closing down due to budget cuts. But I saw it as a possible life raft, spotted just as I’m about to go under. I’m not at all dramatic. The informational meeting that I spoke of was scheduled for Wednesday night. Fiddledaddy gave me his blessing as I ran out the door. He knows this is something that I need to fully explore. I know that it’s his desire for our children to be homeschooled. I am so grateful that he’s not pressuring me, but allowing me to process all of my issues. There’s a lot to process, BELIEVE YOU ME. Anyhoo. I turned the corner to head to the local high school where the meeting was being held. The line to enter the high school parking lot was backed up a good 2 miles. I knew that making a left into the parking lot would take a sweet forever, so I high tailed it down to the light at the intersection passed the school, and made a LEGAL U-turn so that I could then make an easy right into the high school. I don’t consider that cheating at all, but rather being resourceful. I was able to secure a parking space at the far end of the lot, and then set off on foot, burning a path in the asphalt with my high speed walking capabilities, which have recovered HUGELY since the onset of Lyme Disease, thank you very much. Parents were making haste all over the lot in an effort to get into the line that had formed outside of the building. And then it happened. I tripped over a speed bump. A SPEED BUMP. Who does that? Later when recounting the incident, Fiddledaddy asked, “Did you go down?” I assured him that I did not, but I made a spectacular windmill demonstration as I attempted to stay vertical. And I didn’t even drop my iPad, which I brought along to take copious notes. Or play Scrabble should I lose interest in the meeting. As I got up to the doors, a nice police officer was explaining to the powers that be that they were over capacity in the auditorium and no one else could enter. The adjoining cafeteria was then opened so the overflow could enter. The only problem with that is that you could hear NOTHING of the meeting. Because I’m determined, wiry, and short, I was able to worm my way up to the opened double doors and edge my way just to the inside, so that I could hear what was going on. Indeed, the auditorium area was standing room only for a bunch of sardines jammed into all the corners and crevices. The really mischievous side of me so wanted to yell FIRE but I instinctively knew that I’d be trampled. And then arrested. And since I’m up 2 or 3 dress sizes, horizontal stripes would not suit me. The program director was a wonderfully engaging speaker. He was the same director who wrote a beautiful letter on the charter school website mentioning GOD not once, but TWICE. About 15 minutes into the speech, just as all the smells of packing 400 people into a small space was wafting by, assaulting my heightened olfactory senses, the director mentioned that they had just made the difficult decision to only go up to the 7th grade for the first year of business. BUT I HAVE AN UPCOMING 8TH GRADER! My mind raced as I had to reconfigure having them at different schools. One of the major draws of this charter school was that I would have all 3 of them under one roof. For one blissful year. It was then that I knew this door was closed to me. With peace in my heart, I turned and wormed my way back out through the throngs, back to my car, taking great care to step OVER the speed bump. I’ve since really given a great deal of thought to what it would mean not to homeschool. 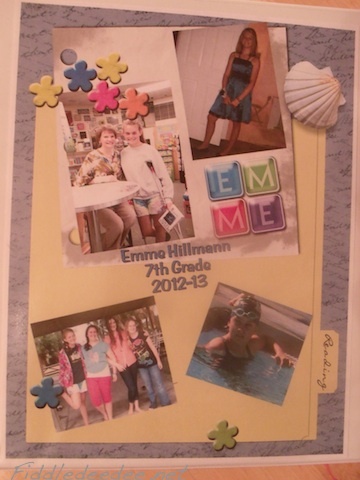 Junior High (in our area) is out of the question for my Emme. And Classical Conversations has really been a good fit for her. And then I have to consider Jensen’s physical issues with this Atopic Dermatitis. I doubt very much he could cope in a setting like school, should he have an outbreak. So for now I’m putting it all in perspective and clinging to my other dear homeschooling friends with whom I share the same struggles. One such dear friend is looking into contacting this new Charter School about putting together a proposal for a homeschool outreach program. Besides, as my SIL reminded me, if we don’t homeschool, we have no excuse to attend the Homeschool Convention in May. Excellent point. And yes, I’ve made my reservation and may have begun packing. Anyone else struggling at this point in the year?